What’s a golf book doing among the rest of these literary books? Because it has stylized, lofty, quirky writing. It’s the most interesting and entertaining book about how to swing a golf club that I ever read. Herbert Warren Wind was a sportswriter, of golf primarily. He wrote for Sports Illustrated a while and for The New Yorker for several decades. He lived to nearly 90 and died in 2005. The Hogan book came out in 1957. It is the most famous golf instruction book ever produced. Many golf books after it are repackaged derivatives. The language is formal and wordy and over-wrought. Half Eisenhower didactic and half Victorian ornate. The info is still there. 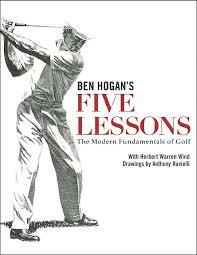 Hogan said he actually meant to understate his golf tips and allow the readers to study and learn by implication. The aha! moments would make them better golfers. The dense eloquence of Wind’s stern and repetitive instructions makes this difficult. But the advice is there, ready to be mined and refined. There are subtleties if one looks for them. The expert drawings by Tony Ravielli help make the book succeed. Posted in booknotes on February 18, 2015 by Wm P.